When making protein or other supplement shakes the biggest problem you’ll have is trying to get them lump-free. No matter how much you stir or shake the drink, not all the powder will dissolve fully. You can use protein shakers that have a wire ball to help break up lumps, but even that needs a lot of shaking and it’s highly likely that they leak at least a little. That’s where the best blender for protein shakes can help you. With a protein shake blender bottle, you just plug it in or use batteries and let it run. The small size, makes it better for single shakes than regular countertop blenders. Some models will only do a liquid shake because of the way the blender works, while others can handle ice too. You have to be careful to not run these small powered models too hard or the motor will burn out. If you’re using these to crush ice or frozen fruit, do it in bursts and not continuously. Check out all the personal blenders for protein shakes available on Amazon! If you want the most absolute portable personal mixer on this list, then the PROMiXX 2.0 Rechargeable Vortex Mixer is the way to go. It uses a lithium ion rechargeable battery which essentially means, you can make a powdered smoothie virtually anywhere. If the battery runs out, there’s even a USB charger to recharge it. Since this is not a traditional blender by any means, it won’t blend solid foods. Forget the ice cubes and fruit or vegetable pieces. It’s made to blend and mix powdered supplements, and for that, it has few equals. The battery charges in about 1 hour, and it has the potential to last up to 2 weeks without another recharge. You’ll need a USB port for charging, but since virtually everyone has one, that isn’t going to be an issue. The 16,000 RPM swirling speed means that everything is going to be mixed together without any chunks, or powdery dry spots, and you’ll be able to take this blender wherever you want to go. The blunt blades ensure that nutrients are left intact. There is no finer outdoor powered mixer than this one. You can take it on hikes and make mixes for lunch, and as you can see, the versatility for having a protein, or other mixed drink when you want it, is almost endless. Granted, this is the most expensive personal blender on this list, but if you are active and on the run, and want your protein shakes wherever you are, the PROMiXX is the best protein shake blender to buy. 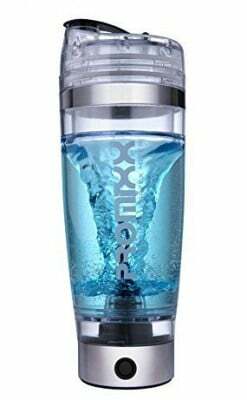 If the 2.0 version isn’t available, you could consider the original Promixx version, but that one does not come with a rechargeable battery and the ones you use will last for about a month if you make two shakes a day. Black & Decker makes a great inexpensive personal blender with the Black and Decker Fusion Blade model. In fact, it is also our pick for best single serve blender under $50. The 275 watt motor will make short work of ice, and although a bit on the loud side, grinding ice is never a quiet endeavor. It works equally well for making protein shakes and vegetable juice, and it comes with two 20-ounce bottles that are designed to fit into the coffee cup holder in your car. That means you can take your smoothies virtually anywhere. The unique blade design is what this unit is all about, with an upturned blade design that will literally shred ice. It will puree as well as chop, so regardless of what type of fruit or veggies you want to mix, you’ll be good to go. The bottles are BPA free, it’s got a simple “on” and “off” button for ease of use, there are several color combinations to choose from, and it comes with a 2 year limited warranty. For the price, this one is hard to beat and your protein shakes will be as smooth as can be. From Oster, a name well respected as one of the finest blender manufacturers out there, comes their version of the personal blender called the Oster My Blend. It is available in several color combos, and you should be able to find one that fits in you kitchen color decor. It’s a 250 watt motor, which is slightly down on power than some, so if you’re adding ice to your shake, you would be better served to add half the ice in the beginning and then half the ice at the end. That will provide a smoother smoothie, and less unblended ice or frozen fruit chunks. For protein powder shakes, users say it works great. It features one-touch operation but no on-off switch so you have to unplug it once you’re done. It comes with one 20 ounce sport bottle, BPA free, that will also easily reside in a car made coffee holder, and the bottle top has a hook on the lid that makes it easy to carry and go. You could loop it onto a bicycle handlebar or clip it onto your belt, and take your smoothie or protein drink with you no matter how you get there. If it ever overheats, it has a resettable breaker, and you can easily get bottles and other accessories from Oster. This would be a great personal blender for college dorms and campers. Just because you don’t want to spend a fortune on a personal blender, doesn’t mean you still can’t get a quality unit. And quality, with great customer service to back it up, is what you’ll get with the Hamilton Beach Single Serve Blender. The 175 watt motor is the smallest here, but if you put the ice on top of the liquid ingredients, you’ll be able to make terrific smoothies. It’s BPA free and the bottle is dishwasher safe. It comes with 1 bottle, and at 14 ounces, it’s the smallest size here, but extras are available if you want them. The base will reside in the coffee cup holder in your vehicle, and it comes in a few different colors to fit your decor. This is the lowest priced blender on this list, but it is capable of making purees and making baby food too, so it is a versatile little unit all it’s own. It has a pulse button rather than an on-off switch, so you have complete control over blending. If you are just getting into making smoothies or protein shakes, or you like the fact that the bottles are only 14 ounces, this one-touch easy to use personal blender, is priced right.